We are in the business of supply and making the end terminations and straight joints of H.T. Power cable and L.T. Cable since the year of 1989. We have qualified team of Cable Jointers trained from ITI working to provide Cable Jointing Services since a decade. With enriched industrial experience and knowledge, we are providing a qualitative Underground Cable Jointing Services. The provided services are executed as per the requirements of our precious clients. Our experts check all the steps and parameters associated with these services and carry out them in the best possible manner. We undertake the Electrical Jointing Services for various well reputed companies min India. We have professionals who are trained by manufactures for heat shrinkable or push on type joints. Moreover, the instruments and devices used by them are modern and sophisticated. · We are providing electrical & Instrumentation cable jointing services for HT& LT cables all over india. We are a unique name in the industry to render our esteemed clients the best quality Cable Jointing Kit Service. The imparted service is carried out by our skilled team of professionals in the best possible manner. We are rendering Cable Jointing Service. These services are accomplished by professional’s team who has prosperous industry expertise and practice. To rendering this service in effective way, our professionals employ the advanced techniques. 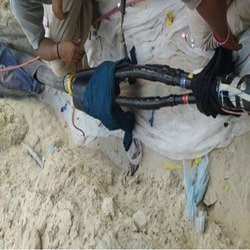 We undertake the cable jointing services for various well reputed companies min India. We have professionals who are trained by manufactures for Heat Shrinkable or Push on type joints. Moreover, the instruments and devices used by them are modern and sophisticated. Frontier Technologies Pvt. Ltd. [Frontec] is a manufacture of heat shrinkable cable jointing kits for LV & MV cables since 1987. Frontec cable jointing kits are delivering reliable service with leading Utilities and Electrical Contractors throughout India. We are capable of offering a wide spectrum of services like Cable Jointing Works. These cable services are extensively used in commercial buildings, industrial complexes or over large distances. Moreover, these Cable Jointing services also differ depending on the capabilities of the cable.